What Donald Rumsfeld taught me about writing | Thinking is the enemy. Donald Rumsfeld, secret wordsmith of the Pentagon. I recently went to see The Unkown Known, the documentary about Donald Rumsfeld. Rumsfeld, for those of you who didn’t have to suffer through the ’70s and ’80s, is an American political survivor who served under four Republican presidents, including two stints as Secretary of Defense. Interestingly, he was both the youngest and oldest person to serve in that position. After thinking about the film for a few days, I realized Donald Rumsfeld had a lot to say — about writing. Whatever it was he said. The documentary makes use of thousands of Rumsfeld memos to zero in on issues surrounding the Iraq war. The film estimates that in his last six years of service alone, Rumsfeld produced approximately 10,000 of these “snowflakes,” as he calls them. That means Rumsfeld was writing something like five memos a day — and that assumes he worked every day of the week. Rumsfeld was obsessed, perhaps unsurprisingly, with language. His memos frequently advised the recipient to look up terms in the Pentagon’s official dictionary, or included definitions from the OED. Sometimes he gave the impression of being confused or obtuse, but it was almost always deliberate. 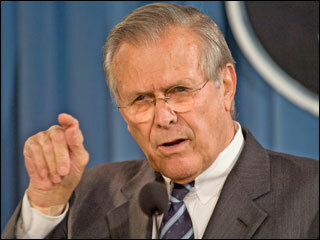 Rumsfeld carefully considered every word he put to paper, and if caught in a lie, used words to worm his way back out. I guess advice on writing is everywhere, if we look hard enough. Just make sure you have something more substantial than words if you plan on invading Iraq. This entry was posted in Film, Writing and tagged donald rumsfeld, poetry, rumsfeld, the unknown known, writing. Bookmark the permalink. Very interesting post, Chris. I’ll have to take a look at the documentary and the book you mention. I spent a lot of time hating Rumsfeld when he was SOD, but I guess we can learn a lot even from people we dislike.